Caitlin Green: Anglo-Saxon or sub-Roman: what should we call Lincolnshire in the fifth and sixth centuries? The fifth and sixth centuries in Britain are difficult in many ways, not least the great variety of names which are applied to this period by academic historians. For some these centuries continue to be a 'Dark Age', a name that is often criticised but which still finds its way into fairly recent book titles. For others it is the 'Heroic Age', as in the title of a current academic journal concerned with this period, whilst others go for more sober but still very telling names such as the 'early Anglo-Saxon' period, the 'sub-Roman' period, 'Late Antiquity' or even the 'Brittonic'—'British'—era. Each of these names does, of course, suggest a variety of conflicting conclusions as to the nature of these centuries and what actually took place in them. Given this, the question I want to ask here is, quite simply, how appropriate are any of these names for use when describing Lincolnshire in the fifth and sixth centuries? 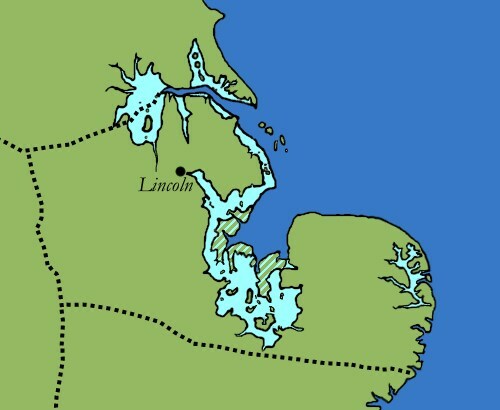 The Lincoln region in the late Roman period and after, showing the landscape of the region, the location of Lincoln, and the likely boundaries of one of the four late Roman provinces of Britannia controlled by this city (drawn by C. R. Green). Dark blue represents the sea, green permanently dry land, and light blue the wetlands and salt-marshes; the siltland around the Wash is striped to reflect its low-lying nature and origin as marine deposits in this period. For further details of this map, see here. 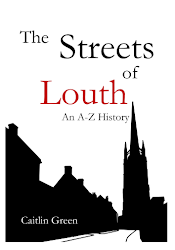 Let us start with what is perhaps the most common term for these two centuries in Lincolnshire, namely the 'early Anglo-Saxon' period. Certainly, from the perspective of the early seventh century, this does not seem an entirely unreasonable term. The Roman diocese of Britannia, along with the relatively peaceful political unity that it represented, had long since dissolved, to be replaced by a number of small and not-so-small kingdoms. In eastern and southern Britain, these kingdoms were ruled by lineages who believed themselves to be descended from fifth- and sixth-century 'Anglo-Saxon' immigrants to this region who had arrived from the area of present-day northern Germany, Holland, Denmark and Scandinavia. 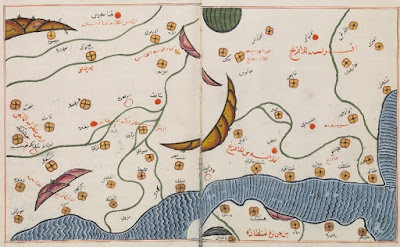 Furthermore, it is often argued that both the material culture and language of these immigrant groups were fully dominant in the region by the seventh century. A variety of evidence might be cited in support of such a model, the most important of which are the great cremation cemeteries of the region. The scale of these sites does need to be emphasised—whereas in most of eastern Britain, 'Anglo-Saxon' cemeteries of the fifth and sixth centuries rarely contain more than a couple of hundred of burials and more often contain only a few tens, the largest of these sites contain thousands. Indeed, Lincolnshire boasts two of the three largest fifth- and sixth-century cemeteries known from England, with over 1,800 graves excavated from the Loveden Hill cemetery (out of a potential original total of c. 3,000) and over 1,500 excavated at Cleatham. Indeed, it seems likely that these cemeteries acted as social and sacred 'central places' for sizeable surrounding territories and their inhabitants, many of whom were buried in the main cemetery, whilst others were buried in surrounding subordinate small cemeteries. All told, given that such cremation-cemeteries have cultural links to the Anglo-Saxon 'homelands' on the continent, there seems little reason to doubt the reality of 'Anglo-Saxon' immigration into this region; indeed, Lincolnshire looks to have been one of the primary foci of this immigration on present evidence. 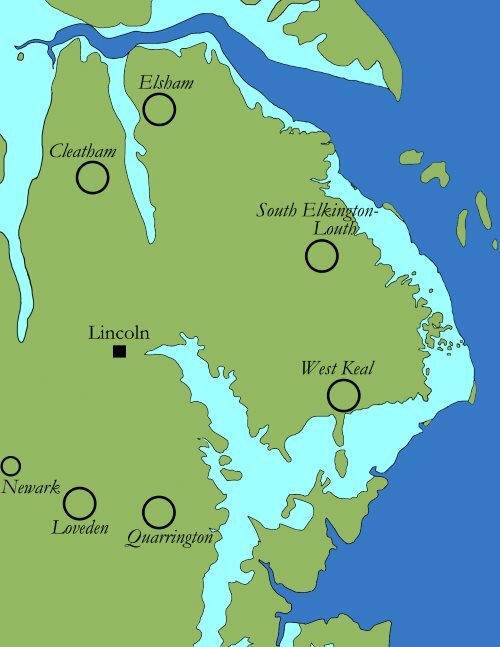 The major early Anglo-Saxon cremation cemeteries of the Lincoln region,set against the late/post-Roman landscape (image drawn by C. R. Green, based on Green, Britons and Anglo-Saxons, fig. 11). The site of Loveden Hill Anglo-Saxon cremation cemetery, as visible on Google Streetview; click here for a larger version of this image. However, we do need to be careful here. 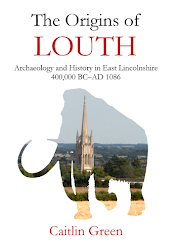 Even if we add in the smaller, later fifth- to seventh-century Anglo-Saxon inhumation cemeteries known from the Lincoln region, which have a much wider distribution than do the large cremation cemeteries, it has to be admitted that there are still significant issues with the notion that Lincolnshire in the fifth and sixth centuries was wholly 'Anglo-Saxon'. First, there are still large gaps in the distribution of both the cremation and inhumation cemeteries by the end of the early Anglo-Saxon period, with none at all known from the Fenland territory of the supposedly Anglo-Saxon Spalde, nor from extensive areas to the north of the River Witham and to the east of the River Trent. Second, even in those areas that had at least some culturally Anglo-Saxon cemeteries by the seventh century, there are still notable differences in the quantity and date of the material found. For example, in the 'peripheral' Loveden and Kirton-in-Lindsey areas we have thousands of burials dating probably from the fifth century onwards in the great Anglian cremation cemeteries, with sometimes many hundreds in the nearby inhumation cemeteries of this area too (for example, the inhumation cemetery at Sleaford probably contained around 600 burials). However, closer to Lincoln itself, most of the known cemeteries apparently present by the seventh century only contain 5, 10 or 15 graves, and a phasing of these indicates that small Anglo-Saxon inhumation cemeteries only really encroached into the area around Lincoln after the early sixth century. Given this significant variance in the density and date of early Anglo-Saxon burials across Lincolnshire, we do have to wonder whether it is really appropriate to speak of the fifth- and sixth-centuries in Lincolnshire as being wholly and entirely 'early Anglo-Saxon', especially early on in this date-bracket, when the immigrant culture appears to have been even more limited in its spread than it was by the end of the period. If Lincolnshire cannot be considered wholly or entirely 'early Anglo-Saxon' even by the start of the seventh century, and appears to have been even less so in the fifth and earlier sixth centuries, what then was it? In this light, it is worth considering further the fact that significant areas appear to have been empty of, or only sparsely populated by, culturally Anglo-Saxon graves in this era. If they were not entirely devoid of population and abandoned, a hypothesis now generally considered to be extremely unlikely, then were they were culturally and/or politically dominated by the former Romano-British inhabitants of this region? In other words, was Lincolnshire, or at least parts of Lincolnshire, in some way 'sub-Roman' or even 'Late Antique' in these centuries, perhaps with the local Romano-British culture and institutions only gradually declining through the fifth century and the label 'Anglo-Saxon' potentially becoming more generally appropriate towards the end of the sixth-century? Once again, there is considerable merit in this position, with a strong case to be made for the former Romano-Britons of Lincoln having continued to control a large area around the city into at least the early sixth century. The avoidance of the former provincial capital by the major cremation cemeteries of this region is in itself important evidence for such a post-Roman British territory, offering a very marked contrast to the situation at and around other major Roman centres in eastern and northern Britain such as York, Leicester, and Caistor-by-Norwich, where significant Anglo-Saxon cremation cemeteries are found close by. This avoidance of Lincoln can be very clearly seen on the second map above, with the nearest large cremation cemetery to Lincoln being that at Loveden Hill, over 27 km to the south of the city. Furthermore, as was noted above, the small inhumation cemeteries similarly only really start to encroach on Lincoln after the early sixth century, something which is again suggestive. However, the cemetery evidence does not stand alone. Only a selection of the evidence can be cited here, but of particular note is the fact that the name of a post-Roman British territory focussed on Lincoln—*Lindēs—was actually preserved in both British and Anglo-Saxon sources and names, most importantly in the seventh-century Anglo-Saxon kingdom-name Lindissi and the modern district-name Lindsey, both of which derive from the Late British territory-name *Lindēs rather than any Old English name. 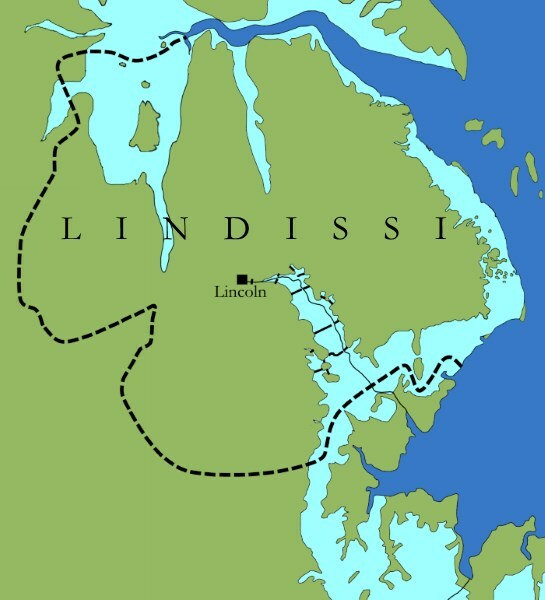 Moreover, the Anglo-Saxons of Lincolnshire's own name for themselves—the Lindisfaran, 'the people who migrated, faran, to the territory of *Lindēs'—makes explicit reference to the fact that they arrived as migrants into this British territory of *Lindēs. Similarly, there is now a remarkable quantity of British fifth- and sixth-century high-status metalwork known from the Lincoln region, which suggests a significant degree of post-Roman British activity here and the presence of British elites throughout the region. 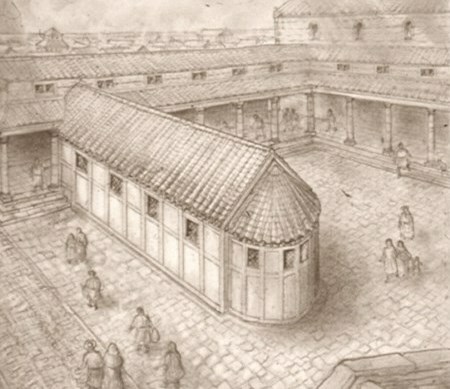 Perhaps most notable of all, however, is the fact that a recent reconsideration of the radiocarbon and other data from the excavated apsidal church at St Paul in the Bail, Lincoln, indicates that this was almost certainly a British church of the fifth–sixth centuries that was located in the centre of the Roman forum and able to hold up to 100 worshippers, not a later Anglo-Saxon construction as has sometimes been suggested. The distribution of early Anglian cremation-predominant cemeteries, represented by filled squares, plotted against Saxon artefacts of the second half of the fifth century, represented by stars, and the Late Roman provincial boundaries (image: C. R. Green, published as Green, Britons and Anglo-Saxons, fig, 21a). As such, a label 'sub-Roman', or even 'Late Antique', would seem to have some applicability to the Lincoln region, especially for the fifth and earlier sixth centuries. Indeed, there are even hints that a vestige of Roman provincial control from Lincoln survived at least some way into the fifth century. Although we do need to be cautious here, it has been suggested that a real distinction appears to be observable between a mainly Anglian cultural zone and a mainly Saxon one in the archaeology of the fifth century, and that the dividing line between the two accords surprisingly well with the most recent reconstruction of the Late Roman provincial boundaries, with early Anglian cremation-predominant cemeteries being nearly all located within the province controlled by Lincoln. Equally, a tentative case can be made for the major cremation cemeteries of Lincolnshire having been sited in a ring around Lincoln as part of a deliberate defensive scheme for the protection of the former provincial capital—not only are the cemeteries at or close to potential strategic sites, but their distribution is very similar in pattern to that of the apparent last stage in the deployment of the late Roman army in the Lincoln region (based on recent artefactual studies), leading to the suggestion that the people who used these large cemeteries may have been tasked with a similar defensive role with regard to Lincoln. Needless to say, both suggestions would add weight to the case for the region being effectively 'sub-Roman' in the earlier part of the period, rather than there being a complete collapse of Romano-British culture and political institutions here. It is also interesting to note that such a scenario as the above accords interestingly well with the textual, 'Gildasian' account of the Anglo-Saxon arrival in Britain as federate mercenaries, employed by the post-Roman Britons in the fifth century for defence after the withdrawal of the Roman army. Of course, it has to be admitted that the evidence for cultural continuity that we have from Lincoln and its surrounding territory does not approach that found on the continent, nor do we have any epigraphic evidence for continued Latin literacy or evidence for the import of Late Antique material culture and goods from the Mediterranean such as is found in western parts of Britain. Nonetheless, the indications that we have of the existence of a post-Roman British territory based around the former provincial capital are, when taken together, persuasive, and the evidence for both a degree of potential provincial continuity and a continuing Christian community located in Lincoln, using a church built in the centre of the old forum, is most intriguing. However, whilst a 'sub-Roman' or similar label might hold good whilst the Britons retained control of Lincoln through the fifth century, what of the period after the early-mid sixth century, when the 'Anglo-Saxons' were clearly the ascendant power, with Lincoln being the probable centre of an Anglo-Saxon polity named Lindissi—'Lindsey'—in the early seventh century? Can we envisage a simple division of our period between an earlier, 'sub-Roman', stage, which then ended and was replaced by a new 'Anglo-Saxon' one, or was the reality rather more complicated than this would imply? For a number of reasons, such a model seems potentially unsatisfactory. 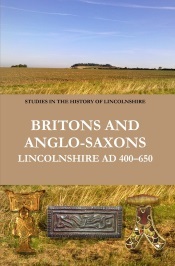 Not only have we already seen that the 'Anglo-Saxon' archaeology of the area immediately around Lincoln remains meagre right into the seventh century when compared to that in the 'peripheral area', but it can be argued that the Anglo-Saxon kingdom of Lindissi was to a large extent simply the British territory of *Lindēs under new rule, both in terms of its name and also of what we can know and reconstruct of its internal organisation. Furthermore, there is no reason to think that the post-Roman Britons simply disappeared or immediately abandoned their 'Britishness' when they lost control of *Lindēs. Indeed, there is a good case to be made both for non-Anglo-Saxonised Britons having comprised the majority of the population of Lincolnshire into the seventh century and for them having continued to be distinguishable within it for some time. For instance, if we look at some of the available linguistic evidence, it is clear that there is rather more place-name evidence for Anglo-Saxon and British interaction than is sometimes allowed, and some of this is particularly intriguing. 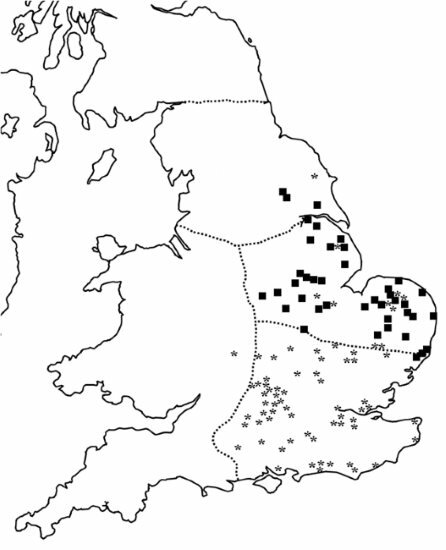 Thus some names from the Lincoln region seem to suggest the continued existence of communities of British-speakers in parts of Lincolnshire as late as the later eighth century (on the basis of our usual understanding of place-name chronologies), whilst others appear to represent 'early Anglo-Saxon' -ingas population-groups named after individuals who seem to possess a Brittonic (British) name, rather than an Anglo-Saxon one. An especially nice illustration of this comes from the area around Threekingham in south Lincolnshire. Here we have a distinct group of high-status, post-Roman British metalwork, suggestive of the presence of members of the fifth- and sixth-century British elite, which happens to come from an area that also has both an -ingas group apparently formed around a man with a British name and other place-name evidence for the existence of British-speakers into the eighth century! Such a combination of evidence is, of course, most intriguing and the Threekingham area might consequently be seen as one in which post-Roman British elites and their dependants 'became' Anglo-Saxon and forming an ingas-group within the new Anglo-Saxon kingdom of Lindissi after the end of British *Lindēs, whilst also perhaps retaining some elements of their 'Britishness' for a period. So, to return to the question we started with, what then should we actually call Lincolnshire in the fifth and sixth centuries? On the whole, none of the names proposed for this era, either nationally or locally, seem fully appropriate for the entire period. Certainly, the notion that this is was truly a 'Dark Age' doesn't really work: our evidence may be thin, but if one is willing to use all of the available evidence—the archaeological, linguistic, literary and historical—then at least the general outlines seem potentially recoverable. However, even if we restrict ourselves to the less romantic labels, we are left with problems. Although the fifth century might well be described as 'sub-Roman' and/or 'Late Antique', with the former Romano-Britons controlling the region from the Late Roman provincial capital, using items of high-status British metalwork which had their roots in the Late Roman period, and maintaining a church in the centre of the old forum, this label doesn't really work for the sixth-century as a whole, with Lincolnshire being one of the primary areas of Anglo-Saxon immigration and the Anglo-Saxons having almost certainly taken over British *Lindēs to form the kingdom of Lindissi at some point in this century. For similar reasons, the label 'early Anglo-Saxon' doesn't really work either: not only does it appear inappropriate for the earlier parts of period, but the kingdom of Lindissi had clear British roots and there arguably remained a strong British element in both the Lincolnshire population and culture through the latter part of the sixth century and into the seventh. In this context, I'm tempted to suggest that if we decide that we must apply a label, or labels, to the fifth and sixth centuries that reflects our understanding of the period, then we might do worse than consider a variant of Chris Snyder's suggestion that the period of British rule after the departure of the Roman legions ought to be termed 'Brittonic', rather than the perhaps slightly-pejorative 'sub-Roman', reflecting the natives own term for themselves at this time (the Britons) and the name of the language that they used (Brittonic, Late British). A term 'Anglo-Brittonic' for the fifth and sixth centuries in Lincolnshire would reflect many of the issues discussed above, emphasising both the undeniable new Anglian element present in the region from the fifth century onwards, whilst also acknowledging that historians no longer imagine that all of the pre-existing inhabitants were exterminated or driven out in that century by the Anglian immigrants, nor that the Britons had no impact on the political and cultural life of the region in this period. However, I fear that introducing yet another term for these centuries is unlikely to prove a popular move, and in the absence of any groundswell of support for such a movement I would suggest that the dry, factual 'post-Roman' is probably the best alternative label that we currently possess, given that it avoids assigning any cultural designation to the period beyond acknowledging that the Roman Empire had surrendered de facto political control in the early fifth century. 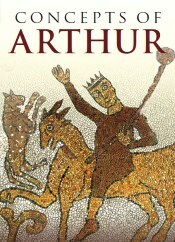 The above post was, in the main, written several years ago as a conference paper on the topic of whether 'sub-Roman' or 'Anglo-Saxon' was a better descriptor of fifth- to sixth-century Lincolnshire, and is offered here simply for interest; fully detailed, referenced, revised, and final versions of the arguments and evidence briefly mentioned above are now available in my Britons and Anglo-Saxons, along with a significant amount of additional material.